Most geographic processors in DSS are based on the Geopoint meaning. 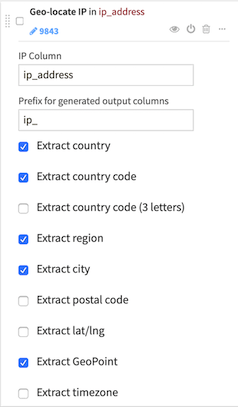 The Resolve GeoIP processor uses the GeoIP database (https://www.maxmind.com) to resolve an IP address to the associated geographic coordinates. To use this processor, you must first install the DSS plugin called “Reverse Geocoding”. Please see Installing a DSS plugin. This processor provides “Geographic coordinates” –> “Administrative data” resolution, at the city-level resolution. To use this processor, you must first install the DSS plugin called “Zipcode geocoding”. Please see Installing a DSS plugin. This processor provides “Country + zipcode” –> “Geographic coordinates” resolution, at the city-level resolution. The Geo-join processor performs a geographic nearest-neighbour join between two datasets with geo coordinates. This processor performs the geocoding of an address using either the MapQuest or Bing API. For details on which kind of addresses are handled, please see the doc of the associated API. This processor (with both API) is extremely slow. Once you are happy with the result, you should export to another dataset so that the processor does not make API call every time you restart the studio.